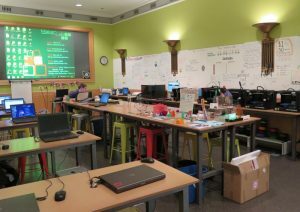 Chicago’s Maker Lab on the 3rd Floor in the Harold Washington Library downtown. While in Chicago last month to see the Strandbeest exhibit we took two maker classes. The first class was creating a greeting card using an electronic cutter and the second an acrylic keychain with a laser cutter. 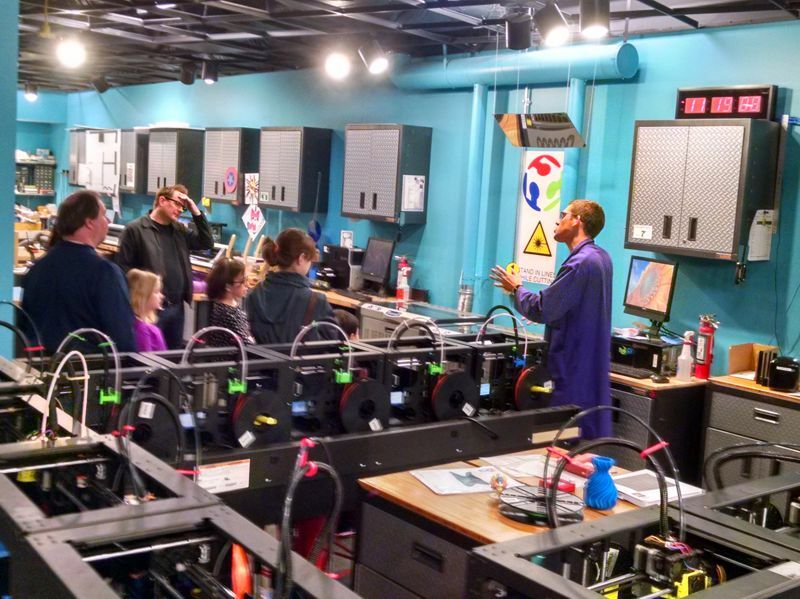 Both were hosted at public makerspaces, although the largest was called a Fab Lab (alternate name for a makerspace). Psychedelic flying pig being drawn by a vinyl (electronic) cutter on a greeting card. The Chicago Public Library (CPL) Maker Lab workshop began by teaching Inkscape to design the greeting card. They supplied a blank template, then using a laptop with Inkscape we added text and art for the card. The saved file was put on a flash drive, imported into the electronic cutter program (Silhouette), and then drawn on the card (the cutter’s blade was replaced with color felt tip pens). CPL Maker Lab was the first publicly accessible maker lab in Chicago, created in July 2013 with a fairly large corporate grant and a 6 month trial/study. While a major portion is classes, they have plenty of ‘open shop’ times, at least 3 hours/day. 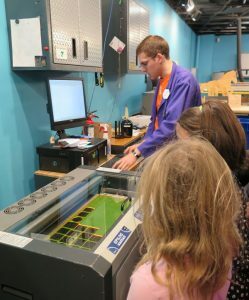 They worked closely with the Museum of Science & Industry (MSI) in creating it, which was our other makerspace/fab lab visit. 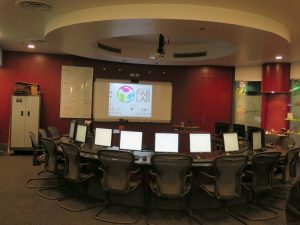 MSI Fab Lab computer area for classes. On the far right wall are 3D prints and lasercut acrylic objects. The Fab Lab in Chicago’s Museum of Science and Industry goes back about 10 years and is part of MIT’s Fab Lab network. Located in the back of the MSI it’s easy to miss, I had walked past it on two previous trips to the museum and hadn’t noticed it was there! 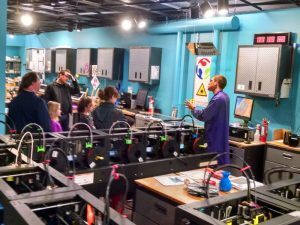 While not open to the public for personal projects or general use, the classes are available for a modest cost ($7-9/person in our case) once you pay the general admission to MSI. They do fill up, so consider booking in advance. A lasercutter cuts and etches an acrylic sheet for the participant designed keychains. The class was well run and began with an overview of the lab, which has a lot of equipment and well organized. 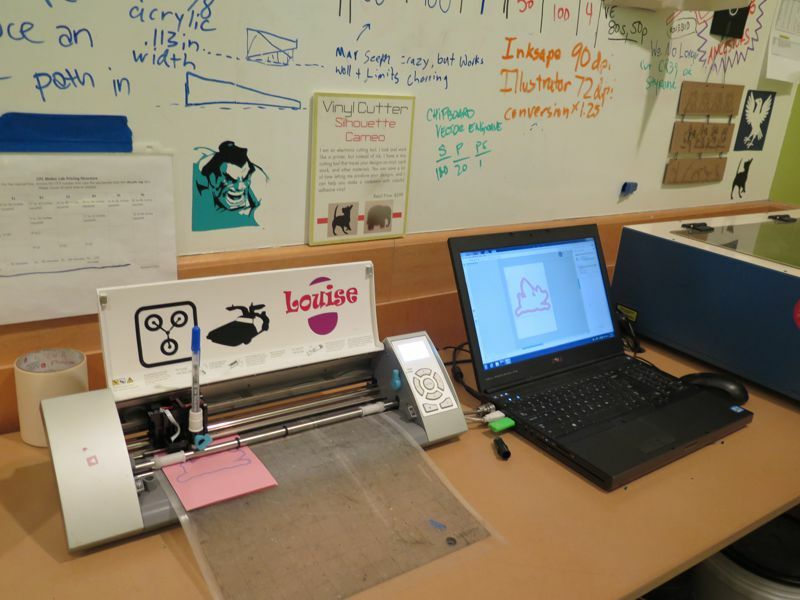 We used Inkscape to create the drawings, like the CPL Maker Lab class, and a template to get everyone started. This was a much more scripted class, which was needed because of the 1 hour timeframe. There was plenty of assistants to coach folks through the lesson and very helpful to all, even offering suggestions to some indecisive younger kids! This lab caters more to the young, although there were adults like myself attending. Part of main Fab Lab workshop; in the foreground are 3D printers and very far wall is an electronics workbench. These were good examples of the Museum & Library-based models of makerspaces. There was significant institutional support in creating both and in these cases they have a massive potential user base to draw on. There are also many makerspaces in our region that started with extremely small budgets and even self-funded. 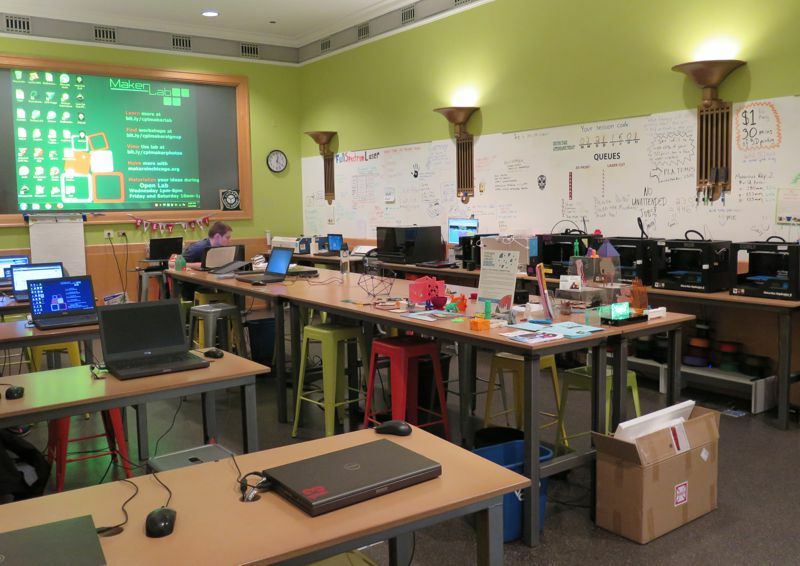 One thing I love about the makerspace community is their willingness to share with others; I ended up with curriculum content and contacts that offered to help we move from a makergroup to makerspace in Greencastle.